Look at our feature !!!! 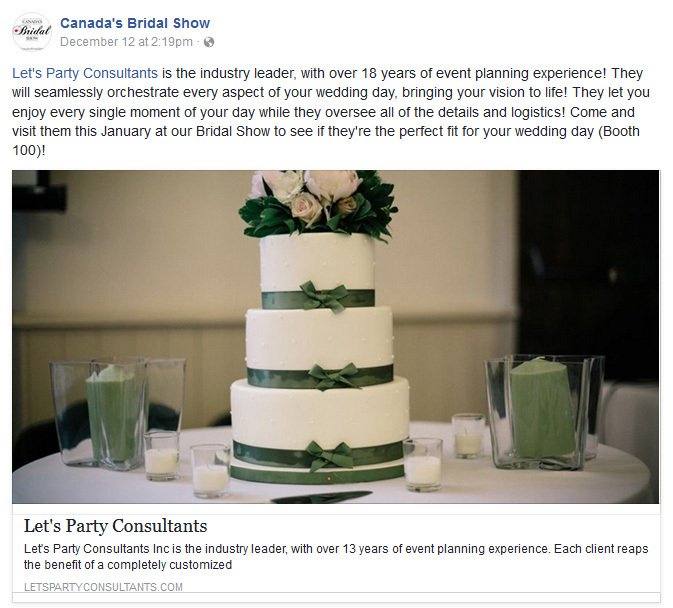 We love Canada’s Bridal Show …. the best and biggest show with so many incredible things to see and do!! You don’t want to miss it – see you there!! Let us help with your Wedding! contact us ~ Lets Party! Full planning, Partial planning & Day of services are available. Packages are customized to suit your needs & budget. Corporate event planning and complete event management is as easy as a click of a button. Our simplified planning strategy is available from the point of inquiry up to and including total management of all your event details. Let's Party Consultants now referred by The Hilton Doubletree Hotel, Toronto. Copyright 2019. let's pary consultants.